Everything you wanted to know about Acquisio and weren’t afraid to ask! Why should I choose Acquisio? Why beat around the bush? Acquisio is designed to do all the stuff you hate doing. All those tedious and time-consuming reports? Automated and at your fingertips in seconds. We aggregate all your networks and campaigns too, giving you complete access to your Search, Social, and Display campaigns in one easy-to-use dashboard. Plus your data is customizable and we provide actionable insights! Choose Acquisio if you want to optimize your paid advertising campaigns using cutting-edge software, accessible to you from any device at any time. When it comes to reporting and search marketing optimization, it doesn’t get any better than this. G2 Crowd reviewers rank us above our competition in key categories like ease-of use, bid optimization and reporting, as well as budget execution & monitoring. We build PPC tools that give you access to clear and customizable data. Acquisio is fuelled by industry-leading scientists who keep busy developing algorithms to automate and optimize campaign management. Acquisio can cut your team’s reporting time by up to 65%, and our optimization features have, on average, helped clients see an 18% decrease in CPA and a 10% decrease in CPC while attaining monthly budgets 77% of the time. Woo! Our AI-powered bid and budget management makes daily leaps in its own intelligence, ‘automagically’ self-improving by ingesting and analyzing massive arrays of campaign data. 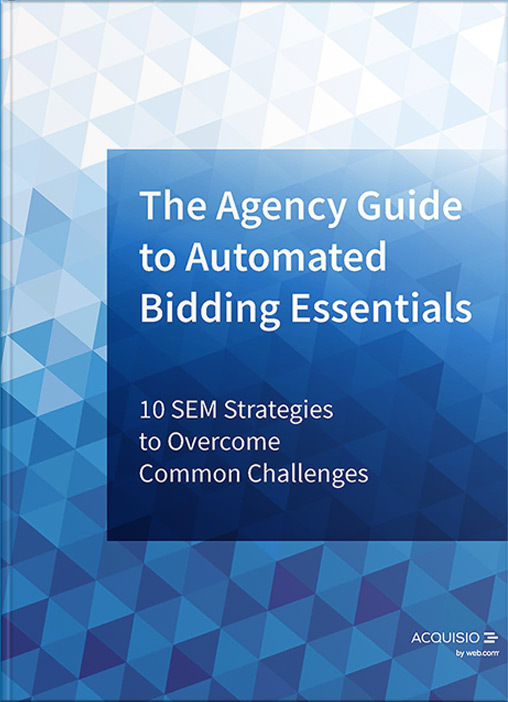 These algorithms do the heavy lifting required to optimize campaign bids and budgets so skilled staff can focus on tasks that require a human touch. We are also renowned for our highly responsive customer success and support teams. And, if you’re looking to integrate PPC into your internal tools, we’ve got you covered with our robust API. How much does Acquisio cost? You’re one of a kind. The price of your performance media solution should be, too. Because your business and your goals are unique, we tailor a pricing structure for you based on really important stuff—like the level of service you need, the amount of ad spend you manage and your volume of accounts. Acquisio is proud to offer a wide variety of affordable packages for businesses of all types and sizes. If you’re wondering which plan is the best fit for you, get in touch with our sales team. Your sales executive will discuss your business needs and offer a tailored plan meet your needs! When it comes to support, we’ve got your back and your front. You can rest assured there’s always a resource available to help solve your issues and answer your questions. And of course you can always reach us by phone at 1-866-493-9070 ext 3, as well as on social media (see the links in the footer). While we do not offer campaign management services we do offer plenty of support to campaign managers. If you’re a Professional or Enterprise client, you have a dedicated account manager to guide you through account set up, issue resolution, campaign optimization, and more! Starter package clients will be supported by an onboarding account manager during their first 8 weeks. Once you’re started off on the right foot, we have a bunch of self-serve resources in our Help Center. Plus, we continue to provide ad hoc support and assistance via email and phone. Is it difficult to get set up with Acquisio? Nope, it’s easy as pie! We work directly with the publishers via their respective APIs, and for the more complex Professional and Enterprise editions we also offer a dedicated account manager to help you with onboarding and your initial campaign import. Once your simple initial setup is done, anything that’s possible to do via the API can be done using Acquisio with no additional effort. What advertising platforms can I connect to Acquisio? Acquisio allows you to import, manage, optimize and report on advertising campaigns across Google Ads, Bing Ads, Facebook, and Instagram! I currently have the Starter Edition; can I upgrade to Professional? Sure! Edition upgrades are so easy it’s almost suspicious. When you decide it’s time, we introduce you to your new account manager, and you’re good to go. Why would you ever want to do that?! But seriously, if for whatever reason you wish to terminate your services with Acquisio, you can simply go back to working in Google Ads, Bing Ads, etc. as usual.